H0 Lloyds Register of Shipping, Certificate No. SAS F000315. Blast over-pressure to 0.47 barG. Fireseal clips should be insulated to avoid ‘hot spots’. 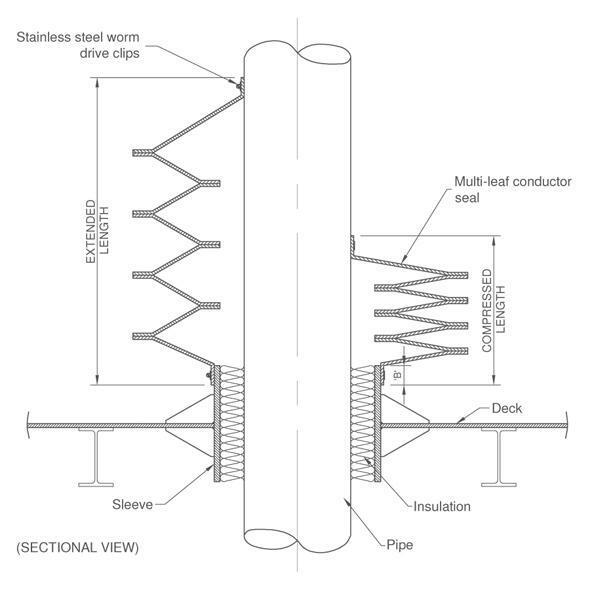 Pipework should be insulated to a minimum of 458mm from the face of the deck. Multi-leaf construction designed to suit significant movement particularly in the axial direction. Each seal is supplied with fitting instructions, adhesive and stainless steel worm drive clips to suit pipe and sleeve diameters.